"I come from the East China. I am making a living in the West America. Half a century ago, a Chinese artist wrote down the above lines in New York when looking into the future. Now, a retrospective exhibition, the largest ever and possibly the last, is being held in his motherland to mark his 70-year artistic career. However, Chen Chi (1912-2005), a master painter of watercolors, passed away on August 4 in Shanghai, only days before the exhibition's opening at the National Art Museum of China in Beijing. "He (Chen) had been busy preparing this exhibition for months. He put his heart into it," said Tao Rongqing, the chief organizer for the exhibition. "Spending most of his life abroad, he was planning to come back and live the rest of his life in China. But he did not make it," Tao said. Presenting at least 100 of Chen's selected sketches, ink paintings, and watercolors, the Beijing exhibition is jointly sponsored by the museum and the local government of Wuxi, East China's Jiangsu Province, Chen's home city. "Chen is gone. But he will always be remembered as a master of watercolor paintings, and a great innovator whose art bridges the East and the West," said Liu Dawei, vice-chairman of Chinese Artists Association. Chen Chi was born in 1912 in Wuxi, a small city, to the northwest of Shanghai. In Wuxi, Chen received education in traditional Chinese literature, history and philosophy and the basics of the traditional Chinese painting from a local high school. Due to his father's financial difficulties in the silk business, in 1926, Chen Chi moved to Shanghai where he was employed in an oil pressing factory. The owner of the factory, having children of the same age, allowed Chen Chi to attend their classes. In 1931, Chen enrolled in an art school that emphasized Western techniques rather than traditional Chinese painting, where he became a member of the White Swan Society, a salon for young enthusiasts of Western paintings. A man with a passion for art and sympathy for underprivileged people, Chen created a series of paintings, such as ""Beggar," "Rice Vendors," and "The Good Earth," depicting average Chinese who were suffering from wars and poverty in the 1930s and 1940s. Dramatic social changes such as the opening of China to the West, which had begun in the 19th century, the downfall of the Qing Dynasty (1644-1911) and establishment of the republic in 1912, and the May Fourth movement in 1919, also heightened his awareness of Western ideas and artistic trends. "I belonged to the younger generation, and we wanted ...the modern style." But Chen tried to find his own way, combining Chinese elements such as the xuan paper, traditional Chinese brushwork and compositional concepts, with the Western influences of Impressionism and Post Impressionism. At 28, Chen stunned the art circles in Shanghai with his watercolor works in annual art exhibitions in Shanghai. Between 1942 and 1946, Chen taught art at the St.John's University School of Architecture in Shanghai. Chen went to the United States in 1947 through a cultural exchange program to paint and exhibit his work. He gave his first one-man show in the United States at the Village Art Center in New York in 1947. He settled down there for most of his life. Extensive travels in the United States provided ample time for the thoughtful and observant artist to merge Eastern brushstroke technique with the Western conception of color. Chen Chi has painted poetic scenes of Washington D.C., Chicago, New Orleans, and San Francisco, but his main source of inspiration has always been New York City. In 1958, he began painting a series of watercolors picturing performances at the Metropolitan Opera House, the most notable being "On The Stage," "The Old Metropolitan Opera-House, New York." Chen Chi's merging of the Orient and the Occident continued to be traditionally beautiful. "We Chinese value beauty in aesthetic terms, as we value peace, tranquility, purity, harmony, innocence, simplicity, humility, love, joy, qualities of the heart which artists in their work express to people," he once explained. 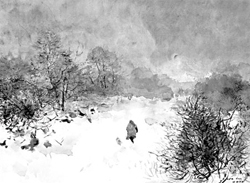 Chen's paintings of Central Park, New York City, under a blanket of snow are pictorially successful as simplified impressions of nature, as are his variations of spring, summer, and autumn. But the images under his painting brush often bear a strong flavour of the traditional Chinese shanshui, or waters-and-mountains, ink paintings. Different from other watercolor painters, Chen also adds Chinese calligraphy, poems, and seals to some of his poetic watercolors. One of Chen's seals reads like this: "wo yi wo fa" in Chinese, or "To create in my own way." But he did not find his own way easily. Chen often shut himself in his studio working for long hours, trying to achieve the desired effects of coloring and composition, wrote Chen An, one of Chen's close friends in New York City, in an essay. For the sake of art, Chen Chi did not get married until he was 40. "In the eyes of his good friends, he was a man of action and little words, living almost like a hermit in a metropolis," according to Chen An. Still, Chen never gave up renewing his artistic style all his life. As Pearl S. Buck said: "The Asian influence in Chen Chi's work is always to be found in his persistent search for essential meaning." Based on his intense observation of nature such as the changing seasons and the constant presence of the sun and moon, Chen was always "able to present with amazing power the elemental forces of nature, wherein man assumes his proportionate place." In his later years, Chen's style gradually shifted from an illustrative, naturalistic approach to one that is more philosophical and abstract-oriented. This is evident particularly in his famous series of the ocean, the fire, the moon, the sun, and the universe works interpreting Confucianism, Daoism and Buddhism concepts. Because of the artist's deep concerns and commitments, it is not coincidental that Chen Chi was chosen as the first living Chinese artist to be honored with a one-man retrospective of his oeuvre in the Chateau de Versailles. This historic exhibition was held in conjunction with the first World Cultural Summit taking place at the Palace of Versailles in June, 2000. Chen received numerous honors, including the Special Award for the Watercolor of the Year in 1955, the American Watercolor Society's Bicentennial Gold Medal in 1966, and the 99th Annual Grand Award with Gold Medal of Honor in 1996. Chen served on the Board of Directors of the American Watercolor Society since 1959 and was a life-long Academician of the National Academy of Design. His works can be found in many public and private collections, foundations, universities, corporations, and museums, including the Metropolitan Museum of Art in New York City. Chen was the first overseas Chinese artist living in the United States who came back to hold a solo exhibition in his homeland, right after the establishment of the Sino-US diplomatic ties in early 1979. Since then, he paid frequent visits to New China and found new inspirations for his artistic creation. In 1990, Chen established a "Chen Chi Art Foundation" and "Chen Chi Scholarship" for students in his home city of Wuxi, where a Chen Chi Art Museum is being built to house 84 works Chen donated last year. In 1999, he donated at least 100 of his works to the Chen Chi Arts Centre at Jiaotong University in Shanghai, where another solo show of Chen Chi was also held. Raymond J Steiner, an American critic, wrote in a catalogue of Chen's watercolor works: "A master of watercolors, Chen's art has delighted peoples from around the globe." It is fitting now, with the Beijing retrospective show honoring the native son of China, the circle has been completed, critics say.